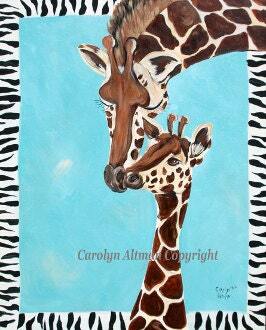 Beautiful Giraffe and baby painting outlined with a zebra print and accented with turquoise background. This painting is great for a Rainforest or Jungle baby or child's room theme. This original painting is on a 30x24 inch canvas and is painted around the edges leaving framing optional.